Planning a trip is never easy, especially during the holidays. This is a time where you need to meticulously plan out every detail for your trip to make it perfect. 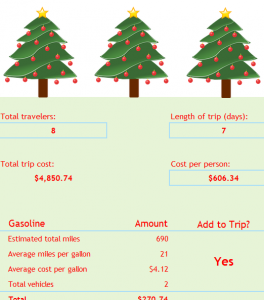 The Holiday Trip Workbook can help make this process easier by calculating the total cost of important aspects of your journey. This will allow you to save money and allocate your funds into things that matter more, like gifts for your family and friends or just making the trip a little better. The Trip Workbook is easy to use and works like a simple budget sheet. Just enter the totals for each category and the Trip Workbook will do the rest. You never have to worry about going over budget again! The space at the top of this table has a place for you to enter the total number of people accompanying you on your trip, the length of the trip, and the cost of your travel for each person. When all of this information is filled out, you can continue down to the next section. The left-hand table of the document will contain a list of different categories for you to enter. Simply go through and fill out the information inquired by the document in the appropriate space. The space below provides a breakdown of major expenses associated with most trips. Included in this document is space for Gas, airfare, meals, lodging, entertainment, and miscellaneous. These sections are further broken down by the category, amount, and if they should be added into the total. If someone else is paying for one of these elements, simply enter “No” under the “add to Trip” column. All the amounts entered into the document will be calculated and displayed in the “Total Trip Cost” section at the top of the page, for your convenience. Plan out the best vacation this year with the Trip Workbook!